When a relationship comes to an end through no fault of their own and your clients still have feelings for their ex-partner, it can feel as though the end of the world has arrived. 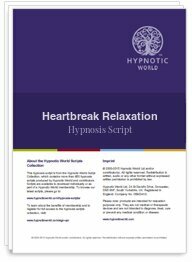 Overcoming heartbreak on one's own can be a long process, however with this Healing Heartbreak hypnosis script download you can accelerate the process, enabling your clients to feel free to move on with their life. At this moment in time, another relationship may be the last thing they want, however as those emotions are put into perspective they can learn to accept that the relationship is over and get on with enjoying life once again. Download this Healing Heartbreak hypnosis script today and help your clients to enjoy this relaxing experience which will prepare them to feel happier and more optimistic about the future.